Lucasfilm publishing and author Timothy Zahn announced a sequel novel to Zahn's novel Star Wars: Thrawn, which was released earlier this year, to an excited crowd at New York Comic Con today. The sequel is titled Star Wars--Thrawn: Alliances and will hit shelves in the summer of 2018. Alliances will also feature Darth Vader in a primary role. No cover art or specific release date were available at this time. 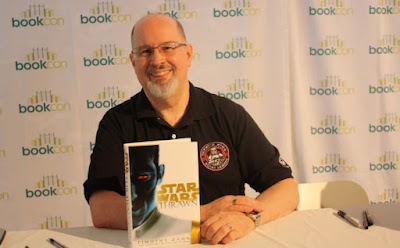 Tim Zahn launched the current era of Star Wars publishing back in 1991 with Star Wars: Heir to the Empire, which introduced audiences to the character of Grand Admiral Thrawn. Following the canon reset in the wake of the Disney purchase of Lucasfilm and the sequel trilogy of films, Thrawn was re-introduced to the new canon in the animated series Star Wars Rebels. Zahn also returned to rewrite Thrawn's backstory in the novel Star Wars: Thrawn which was released earlier this year.